They are, after your house(s) and maybe your car(s), possibly your most valued assets. You can choose to own and operate a boat, yacht or Jet Ski without insurance (although some marinas and yacht clubs won’t let you dock your craft unless you have coverage). However, that’s not a very smart choice. * Note. If you have a homeowner’s insurance policy you may have some coverage for your watercraft but it is very, very minimal. A typical homeowners policy will pay as much as $1,000 to repair damage to your boat, but — guess what? — that damage has to occur while the boat is at your home. This is not exactly the kind of damage coverage you need. In addition, there may be some liability coverage. Some, but hardly enough. 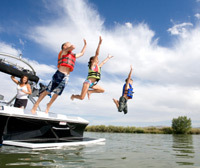 You could gamble and not buy insurance for your watercraft, but that’s a big gamble. You’re risking not only losing or severely damaging the boat in an accident without compensation, but possibly your other assets if your boat causes damage and/or injuries to other boats and/or boaters. In the insurance world, “boats” are usually smaller powerboats and sailboats. Standard policies for boats cover damage to the craft, usually on what is called an “all-risk” basis. In this case, all-risk includes damage caused by fire, lightning, theft, vandalism and windstorms. Many standard policies also cover medical expenses incurred by you, your family and any other passengers on the boat. Some policies also provide coverage for injuries caused by uninsured boaters or by boaters who don’t have enough insurance. If this sounds like uninsured motorist coverage in an auto insurance policy, it basically serves the same purpose. Under a yacht policy, the term is “hull.” Liability coverage under a yacht policy carries the name “property and indemnity,” which insurance people often abbreviate to P&I. As with boat liability coverage, P&I is available in increments of $100,000. Depending on the size of your craft, you can buy P&I limits from $2 million to as much as $50 million. * Tip. This is a complex area of insurance with lots of options. Talk to your agent. Let him or her assess the many options out there and find the coverage that best suits your needs and best protects your assets.